Review and information about IPHONE XR & IPHONE XS (MAX) from our poin of view. We will give several important information about these iPhone product with personal opinion. If you have more information or need to discuss with other visitor, please use comment facilities bellow this article. As we know that Apple release their new version of iPhone at 2018. The cheapest version of iPhone is release with IPHONE XR name. Of course this phone will have some limitation if compare with same year iPhone with more expensive price IPHONE XS and IPHONE XS MAX, but because all of them use same processor, then users will get some complain between these phones. LCD size at IPHONE XR use 6.1 inches with 828 x 1792 pixels resolutions and use IPS LCD, while IPHONE XS use 5.8 inches width with 1125 x 2436 pixels use Super AMOLED (IPHONE XS MAX have 6.5 inches 1242 x 2688 pixels Super AMOLED type). IPHONE XS (MAX) also have Super Retina HD. Main Camera at IPHONE XR use single camera 12 mp f/1.8, while IPHONE XS (MAX) use dual camera 12 mp f/1.8 + 12 mp f/2.4. Internal and RAM at IPHONE XR use 64GB or 128GB or 256GB with 3 GB RAM, while IPHONE XS (MAX) use 64GB or 256GB or 512GB with 4 GB RAM. From above information we can see that IPHONE XR have bigger screen size then IPHONE XS without MAX, therefore the XR battery capacity also have more bigger capacity the XS version. Usually battery usages will be affected by LCD screen width and processor type, however the processor type between IPHONE XR vs IPHONE XS are not different, so both processor will consume or save same power. Like previous version of IPhone X, now Apple use the notch screen for all new version, at least for IPHONE XR & IPHONE XS (MAX). The different screen size will make each version have different size and weight. Advantages of all of these phones use full screen with notch for front camera and speaker. At front body we will not any button like previous Iphone version (except iPhone X). At right size of the body we will find power button and at left side of the body we will find volume button. At the back side body, we will find camera and Apple logo in the middle like other previous product. 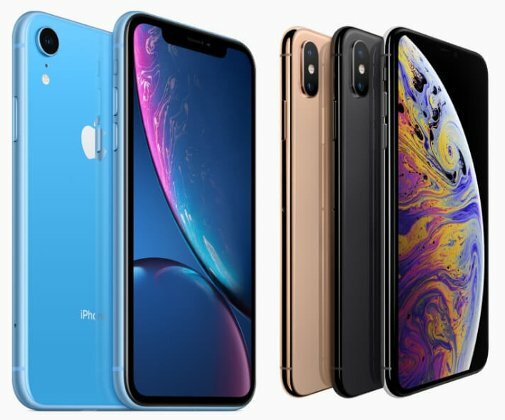 At this year Iphone does not use other manufacture processor such as from Samsung anymore, because the IPHONE XR & XS (MAX) use their own processor which call by Apple A12 Bionic. When they release IPHONE XR & XS (MAX), Apple said that Apple A12 Bionic processor is the smartest processor at these time. This processor use the first 7 nm fabrication in the world. Apple said that advantages of Apple A12 Bionic is more faster and more lower power consumption. Apple A12 Bionic also have Neural Engine which work for AI artificial intelligence with 8 core, work for 5 trillion operation every second. Therefore Apple said that this is the smartest processor ever in the world. Still like previous product, the demerit of IPHONE XR & XS (MAX) do not have headphone jack port. Some users who use previous iPhone will understand about this situations, because they can use converter from lightning port to headphone. But please note, inside IPHONE XR & XS (MAX), there is no converter or audio dongle for headphone jack, therefore we have to buy ourself if we need to use that port.